The staff are so friendly (and speak English, which was a nice plus) and the desk is always manned. You can buy cold drinks and beer in the lobby. My private room was never disturbed and had great AC. The location feels very safe. Lots of young people and families stay there and it has an international vibe. The subway station is only 5 mins away (easiest way to get around the city and to/from the airport, see below). Location and the friendliness of the staff given that I have to check-in at 4am in the morning and they are able to accommodate me. They also helped a lot in providing the tour for the Great Wall which is equally excellent! They allow me to keep my luggage after I check-out for free. The staff was very nice and helpful, the hostel has a very nice location close to the metro and a busy street with lots of restaurants. The location and the staff were okay. The beds are comfortable. The front desk guy spoke great English and was decently friendly. The staff were very friendly and spoke good English. The location was excellent. A very short walk to two different metro stations. Also, it was just a 20 minute walk to major points of interest such as The Forbidden City. The room was a bit small but it was very comfy and warm. Front desk personnel were friendly. 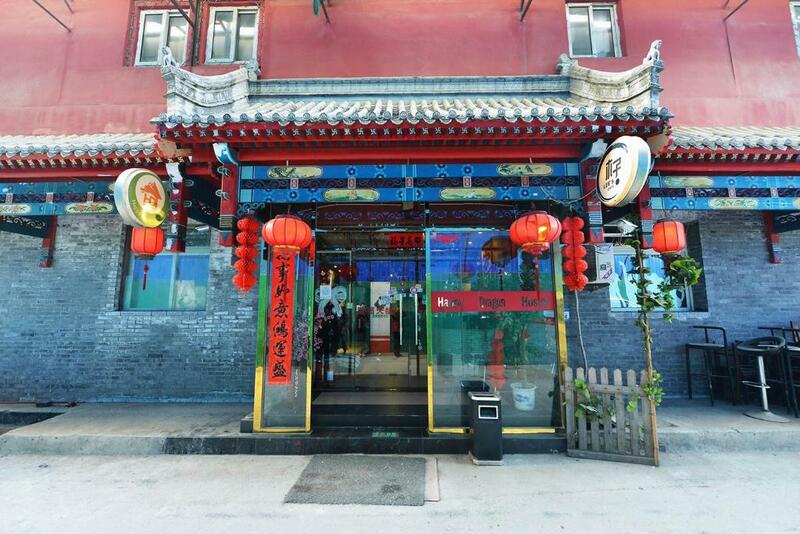 This hostel is near a metro-subway station which is a necessity in Beijing. I was there in winter and the room had good heating,. The shower had hot water. I had quiet. 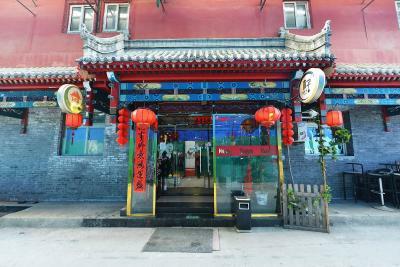 The staff should be more knowledgeable and suggest asking traveler to visit S Luogu Alley. They gave me an idea of the approximate location, but Beijing is very spread out and you should get exact addresses. The internet was useless as everything is censored and banned in China. The bed was extremely comfy! Good location, the room was warm! The staff is amazingly helpful and friendly, English speaking as well. Laundry is done for a good price, which was exactly what was needed. One of our best sellers in Beijing! 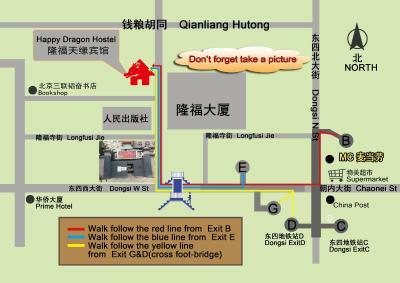 Happy Dragon Hostel is located in Beijing, a 5-minute walk from Dongsi Subway Station (Line 5 & 6). 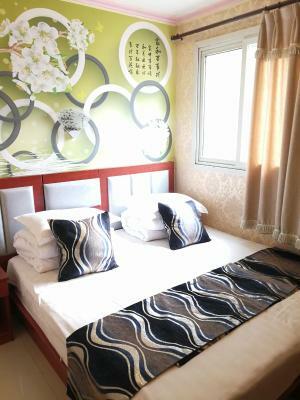 It features free Wi-Fi and air-conditioned rooms with a private bathroom. Happy Dragon is a 10-minute walk from the lively Wangfujing Shopping Street and a 15-minute walk from Jing Shan Park. The Forbidden City is a 30-minute walk away. Beijing Railway Station is 12 minutes' drive from the property, while Beijing South Railway Station is 30 minutes' drive away. Beijing Capital International Airport is 45 minutes' car journey away. 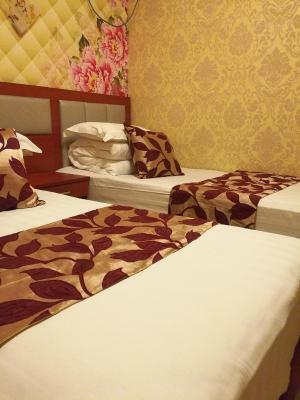 Simply furnished, the nonsmoking rooms at Dragon Hostel have neutral colored walls, tiled flooring and warm lighting. Shower facilities are available. Select rooms have a TV. The property has a communal area. Guests can rent a bicycle to explore the city, or make ticketing arrangements at the 24-hour front desk. There is also a business center. When would you like to stay at Happy Dragon.Backpackers Hostel? Room for 1 guest features an electric teakettle and a TV. Room for 2 guests features an electric teakettle and a TV. Room for 3 guests features an electric teakettle and a TV. House Rules Happy Dragon.Backpackers Hostel takes special requests – add in the next step! Guests are required to provide credit card information for pre-authorization if they book more than 2 rooms. Airport shuttle service is available for a surcharge. Please inform Happy Dragon.Backpackers Hostel of your expected arrival time in advance. You can use the Special Requests box when booking, or contact the property directly using the contact details in your confirmation. The facilities in the room were really worn down. The bath was not really inviting. 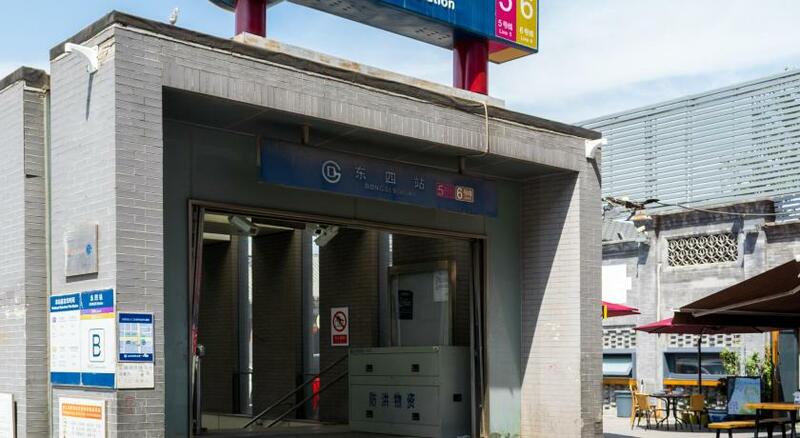 Good location close to Dongsi Metro station. There were lots of positives, but a few negatives. The hostel isn't on the main road, so it's a bit difficult to find. There is nowhere close by for food or snacks. The bed was really hard (felt like a sheet stretched over a plywood pallet, to be honest!). It was great to have my own private bathroom, but the shower had no curtain so water got everywhere. For the price, I was perfectly happy to stay there for a few days, but if you're looking for comfort this place might not be for you! The location is pretty good. As a Muslim traveller, I would really recommend this as it is within close proximity to affordable muslim food and even a mosque. The internet is good. The bed is a little bit hard and the bathroom can be cleaner. Room is quite small but security is good. People were super nice and helpful. The toilet and shower was very small, so it was difficult for me to be comfortable while showering. The room itself was fine but the lighting was a bit gloomy and dim, not very well lit. the water in the bathroom is too weak. You can hear almost everything from others room and corridor. 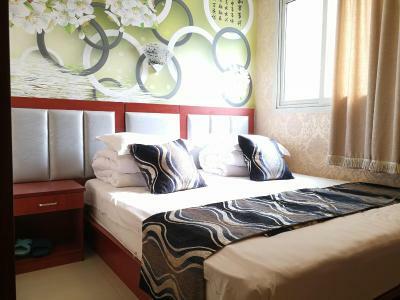 It's quite cheap however looking at the standard of the place it should be even a bit cheaper, but in general it's ok. Carpet was horrible and likely was invested with mold along with the shower. It really screwed with my allergies. But it was super cheap so I can't complain to much. It was very cheap and there is a reason for that. Room service is bad, they only clean the dustbins in room without changing bed sheets and do not provide new towels everyday. Beds are clean and comfort. Bathroom is clean and hot water is provided. Close to the metro. Very friendly staff.